I am quite late coming to colouring stamped images with Promarkers but I thought it was high time I found out what all the fuss is about. For this adventure I decided to treat myself to some new stamps as well as the Promarkers. I thought I would share with you the results of my first attempts at using them and I would like to know what you think. (I should also welcome any suggestions on ways you think I could improve my colouring technique). This is one of the Sugar Nellie Home Grown Manga stamps - Manga Girl # 1. 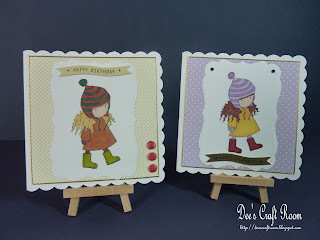 The backing paper is from the Dovecraft range and the sentiment from Kanban Crafts. Another stamp from the Sugar Nellie Home Grown Manga stamps - Coffee Time. 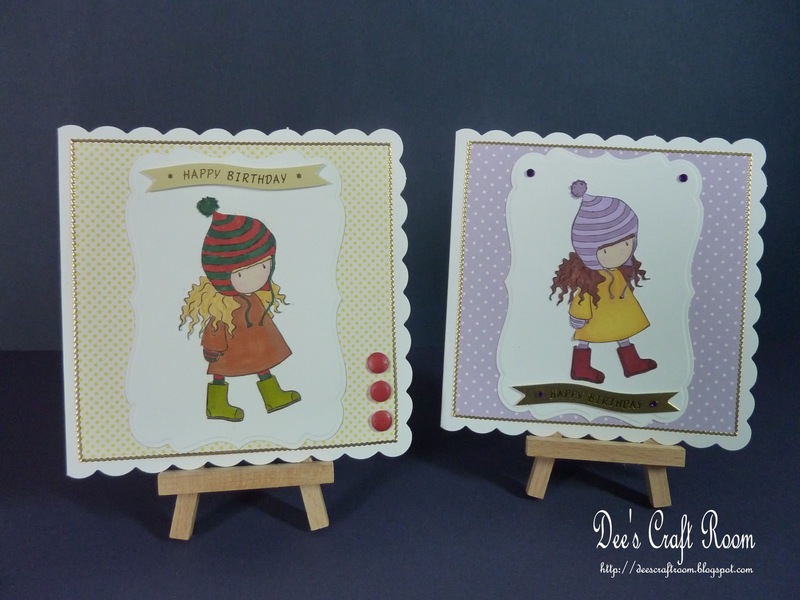 The backing papers are from the Dovecraft range and Polka Doodles respectively. The sentiments are from Kanban Crafts. The mats are cut using my Nesties and the card on the left has three coffee beans in the corner. 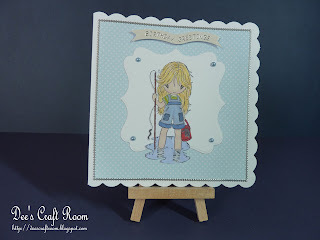 This gorgeous stamp is from the Gorjuss Girls range and the backing papers are from Dovecraft. 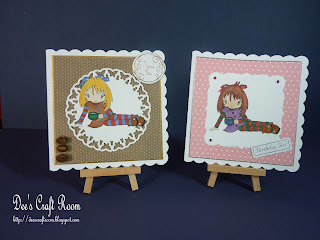 The mats are cut using my Nesties and the card on the left has three Craftwork Candies in the corner. 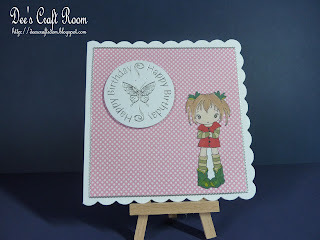 The final Sugar Nellie Home Grown Manga stamp for this post, this one is called Tiny Tidler and I have used more backing papers are from Dovecraft. The sentiment and flat backed pearls were from my stash. I snuck this picture in, as you can see, it is not really a stamped card at all. 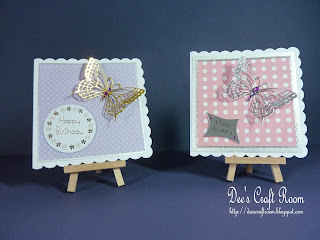 The butterflies are a Marrianne Creatables die, which I embellished with some flat backed gems. 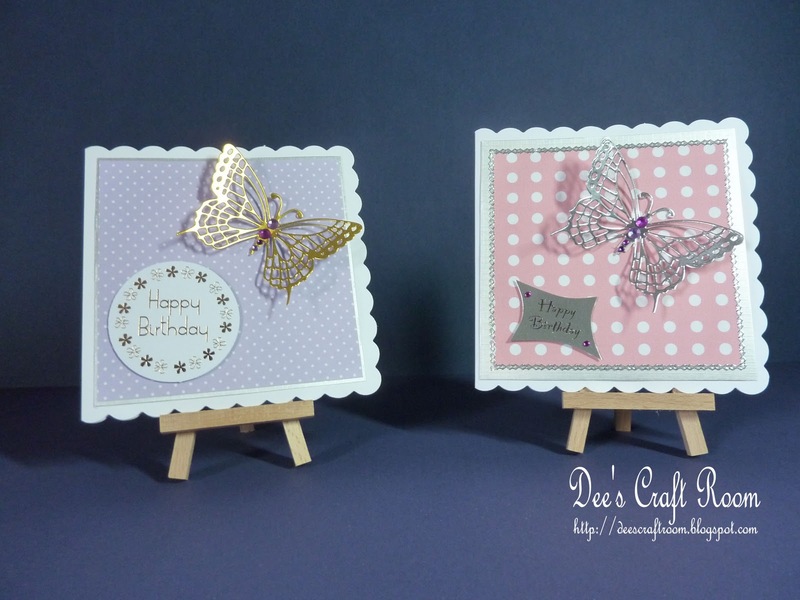 If you use mirri card for the butterfly the wings can be eased up to make the butterfly look like it is in flight. I have coloured more images but have not had time to make them into cards, so watch this space over the next few weeks for more cards.